Joining OEC in 2013, Katherine Golden serves as Chief Technology Officer. She is responsible for overall IT strategic and operational direction for the company’s user experience, software development, quality, business intelligence, infrastructure and operations functions. 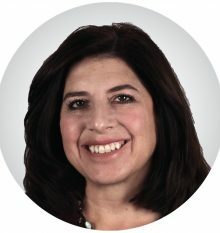 Prior to joining OEC, Ms. Golden was Vice President of Engineering & Enterprise Architecture at Corbis, a digital media licensing company based in Seattle, Washington. During her tenure there, she launched several new global ecommerce products and had a track record of recruiting and retaining top tech talent. Ms. Golden also spent five years in technology leadership roles with AGInteractive, a subsidiary of American Greetings. Prior to AGInteractive, she held multiple entrepreneur and leadership positions at her own start-up and various small businesses. Ms. Golden holds a Master Business Administration from the Fisher College of Business at The Ohio State University and a Bachelor of Computer Science from the University of Windsor in Ontario, Canada. She is a Board member of RITE (Regional Information Technology Engagement), and is an experienced public speaker and strong advocate for outreach programs that foster and promote diversity in tech.